After a study conducted at the request of the United States Congress in 1986, the federal government passed the Nursing Home Reform Act and signed it into law in 1987. The law was designed to ensure that nursing home residents have the right to receive quality care to achieve and/or maintain their highest practical mental, physical and psychosocial well-being. When Chicago nursing home patients are restrained unnecessarily or injured as a result of being restrained, Rosenfeld Injury Lawyers LLC can help you in holding the facility accountable. Contact our office for a free case review of your nursing home restraint case. In fact, nursing home patients have a fundamental right to personal dignity, and the capacity to freely move wherever they choose to go. This fundamental right is never taken away just because the individual is living at a long-term care facility, or under nursing home care. Unfortunately, many nursing home facilities in Illinois use a variety of restraint methods on elderly patients as a way to make it easier for the staff to handle agitated individuals under their care. Too often, minimal consideration is given to any mental or physical damage that could be caused when forcing restraint of nursing home patient. 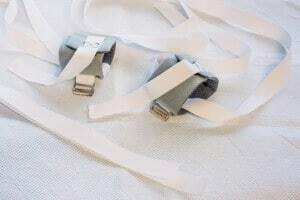 Under normal care, restraints are used sparingly, and generally as the final option to prevent the patient from causing harm to themselves. Only when restraint is absolutely necessary should it be used, and only when individual is presenting the potential of harming themselves. The restraint should be removed at the first sign that the agitation event no longer exists. Physical and chemical restraints can easily escalate into emotional and physical injury, especially when repeatedly administered. Often times, restraint of nursing home patient develop long-lasting psychological damage and ongoing fear that is impossible to erase. Some nursing home facilities use chemical restraints as a way to control unruly patients. Friends and family members are often shocked when their loved one appears withdrawn, uncommunicative, confused or dazed. This is usually the result of a strong medication used as a “potentially inappropriate” way to apply control. Anytime a physical restraint is improperly applied or placed, the patient can easily be strangled and die through restraint strangulation. No resident should be restrained because she or he is a “difficult” patient, requiring more care than others. Anytime a loved one has suffered injuries caused by the illegal use of nursing home restraints, it is essential to maintain their legal rights. Call Rosenfeld Injury Lawyers LLC at (888) 424-5757 for a free no-obligation legal evaluation to stop the abuse immediately. The experienced attorneys can assess the claim, to determine if financial recompense is available. Our Illinois nursing home lawyers are committed to holding the nursing home accountable for their actions, and prevent future infractions of the law on others.